Summertown Construction, LLC. 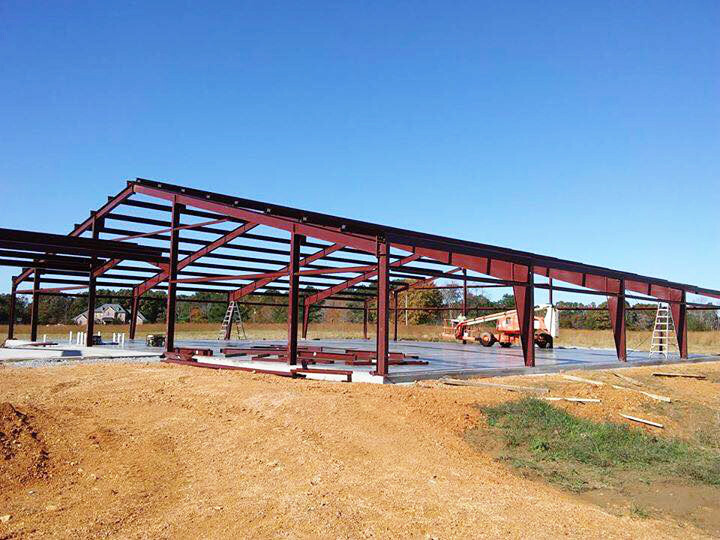 is a fully licensed and insured metal building contractor and a fully authorized A&S steel structure dealership. Summertown proudly serves Columbia TN & Maury County, Lawrenceburg TN & Lawrence County, as well as Pulakski TN & Giles County. Summertown Constructions, LLC. is a fully authorized dealership of A&S Steel Building Systems. As a proud partner, we are equipped to deal, sell, & build quality buildings with flexible designs that provide the maximum utilization of interior space. Our special fabrication practices result in a reduction in building assembly labor, and therefore lower all erection costs for our clients. A&S is one of the largest metal building products suppliers within the industry. A&S Building Structures have amazing design flexibility. They are fast & easy to construct, require little maintenance, and are energy efficient. 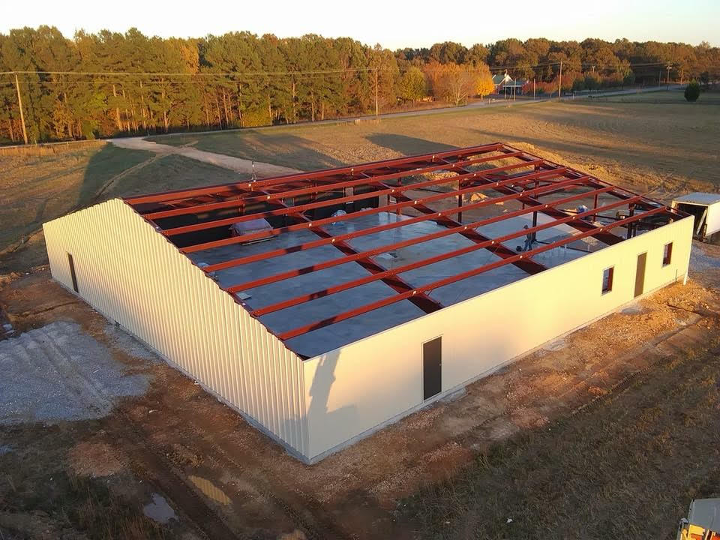 There are a wide range of structures available with A&S, from aviation to crane buildings, gable symmetrical to gable unsymmetrical buildings, and long-bay, lean-to, and single slope buildings. * Image provided by A&S Building Systems. To put it simply, aircraft hangar structures are uniquely engineered to meet specific requirements while also being flexible enough to fulfill even the most complex aviation need. 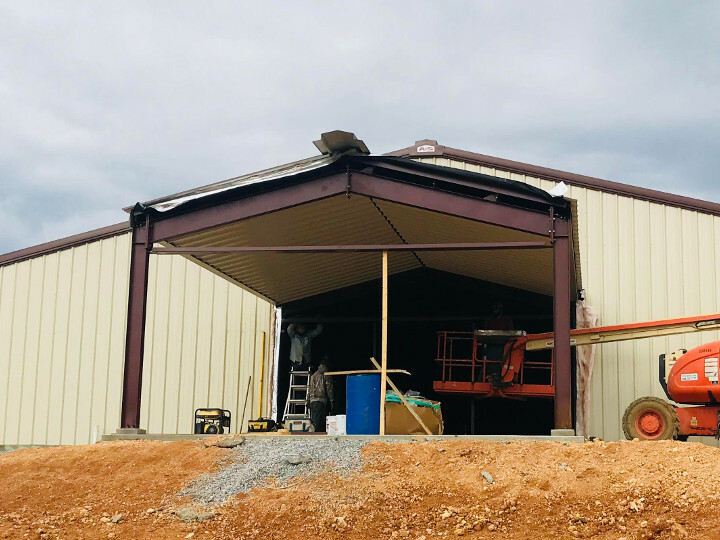 There are various hangar designs that will utilize gable symmetrical, gable unsymmetrical, or single slope structural systems. Column-free interiors, known as “clear span” design, provide for a wide open floor space and eave heights that are large enough to accommodate the larger aircraft of today. There are a variety of door options available, including bi-fold, bi-parting, and stack leaf designs. A&S can also design and fabricate some bi-parting and stack leaf designed door systems. If you’re in need of another door system, these can easily be provided by A&S as a single source provider. A&S has pioneered the use of extra wide clear-span structures, which allow today’s largest jet aircraft fleet the space they need. The crane building is a complex structural system. Crane buildings consist of the crane with trolley and hoist, crane rails, crane runway beams, structural supports, and stops and bumpers. All of these can be supplied upon request during the building proposal. Our partner, A&S, specializes in crane buildings and has furnished some of the largest crane systems in the industry. You can trust your structure in our hands. Some examples of crane building types include: Bridge Crane (top running and under-hung), Monorail, Jib, Stacker, & Gantry. A symmetrical structure type is the ridged (double slope) building. This structure consists of the ridge being in the center of the building. The frames are prefabricated as much as possible. The end wall frames of this structure can either be a basic post and beam type of construction or they can be constructed with a full interior type of rigid frame, which allows for potential future expansion. Flexible designs, such as this, provide for the maximum use of an interior space. All the while, the quality fabrication practices provide for a reduction in building assembly labor, subsequently lowering the erection cost. An unsymmetrical ridged (double slope) building is one in which the ridge is off-center. Same as symmetrical buildings, the frames are prefabricated as much as possible while the end wall frames can be regular post and beam type constructions or can be built with a full interior type rigid frame, which will accommodate any possible future expansions you desire. In order to utilize the interior space as much as possible, flexible designs are constructed. This alongside quality fabrication practices result in lowering the construction assembly labor, which directly lowers the total erection cost. Long bay buildings provide for a clean, uncluttered interior. This structure is the ideal space for operations such as manufacturing, warehousing, distribution, or retail applications. Any operation requiring a large, open floor space with few interior columns will thrive in a long bay space. Our structures feature superior strength-to-weight ratios, as well as greater design flexibility. The Long Bay® System has proven to save money on erection costs in direct comparison to other types of joist construction. These buildings are available with machine-seamed Standing Seam Roof systems or Built-Up, Single-Ply and Multi-Ply roofing-systems. Lean-To buildings are specifically suited to provide you with all the extra space you require directly alongside your building. The Lean-To construction ties in at or below the eave of your building. These structures easily provide for a wide variety of uses, from simply a covered area to a completely enclosed addition to your building. Used for low-rise construction, these buildings only have one slope that depends upon another structure for partial support, which is generally located at or below the eave of the supporting structure. This type of structure is generally used in low-rise commercial construction applications, including: strip shopping centers, mini storage complexes, and office buildings where one-way roof drainage and interior floor areas cannot contain columns. The sloping roof exists on one plane, as the incline reaches from one wall to the other wall across from it. This structure is distinct, due to it’s 1/2:12 roof pitch. The structure is finished with a red oxide primer, which provides an unmistakable appearance. WHY PARTNER WITH SUMMERTOWN CONSTRUCTION? Together, Paul McBride & Terry Potts brings 43 years experience in the construction business. With lower overhead, Summertown Construction can offer quality construction projects at a lower cost to our customers. We're so confident in the quality of work we do that we back it with a guarantee. We've made it the purpose and privilege of Summertown Construction to be known for the high-caliber work that we do. And because we're family owned and friendly, the bureaucratics at work surrounding job satisfaction in larger construction companies just isn't at play. We treat each job site like it's our own and strive to care for each client as if they were family. That's why we guarantee ownership will be on-site for every job we work and complete. From quote to groundbreaking, construction to completion, you can rest easy knowing you're in good hands and that, if any concerns should arise, you'll have an audience with the same person, start to finish. Between our two owners, Terry Potts & Paul McBride, we have 43 years experience in the construction industry. Both were born & raised in the Henryville Summertown Tennessee area and have lived in and served these areas for 50+ years. Honesty, integrity, & a job well-done in everything they set their hands to is the cornerstone of their joint partnership & business venture.